Infectious, hook-ridden songs with multi-layered harmonies and anthemic choruses combined with lyrics from the heart. Melodic rock / pop influenced by such acts as Bon Jovi, Matchbox Twenty, Bryan Adams and Richard Marx. 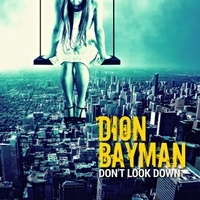 Following on from his acclaimed 2014 release 'Afterburn', Dion Bayman returns with his highly anticipated new album 'Don't Look Down'. As well as having a heavier edge to the sound, 'Don't Look Down' encompasses all the tremendous hooks, emotive vocals, beautiful melodies, and extremely catchy choruses that is expected from a Dion Bayman release. 'Don't Look Down' is a well produced, well written, guitar driven album that will surely please fans of melodic rock/pop. Dion was also becoming known as a singer and performer fronting several popular local rock bands. His entertaining live shows and extensive touring has garnered a large and loyal following. Dion's musical tastes are wide ranging. However, his song writing influences include acts such as Matchbox Twenty, Bon Jovi, Keith Urban, Richard Marx and Bryan Adams to name just a few. If you like songs that are infectious and hook-ridden, containing multi-layered harmonies and anthemic choruses combined with lyrics from the heart, then Dion's new album 'Don't Look Down' will definitely not disappoint.